Hy-Tape has been responding to the requests of our clients to make their jobs and lives easier. We have been supplying the industry with the highest quality zinc oxide based, latex free, waterproof adhesives. That is why we are proud to offer our Hy-Tape Patches. Our adhesive patches have all the same great qualities as our traditional rolls, but are designed to cover a large area. The patches are available in 4” squares and 5” squares and are perfect for making dressings completely occlusive. Our goal was to save caregivers time and money by not only reducing the need to change costly dressings, but to create a waterproof barrier for cleanings. 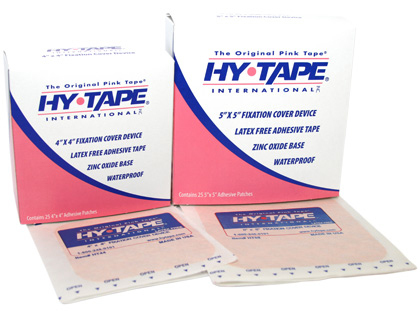 Because Hy-Tape conforms to body contours and can remain in place on oily or hairy skin, our Hy-Tape Patches are a great solution for a multitude of applications.